school or college website. And so your chosen school website software needs to be the very best. Encourage your audience to get in touch through your customisable contact form. Add a number of contacts behind the scenes and enquiries will automatically be sent to the right person. We’ll also store a copy for you in the software for you to access when you need to. 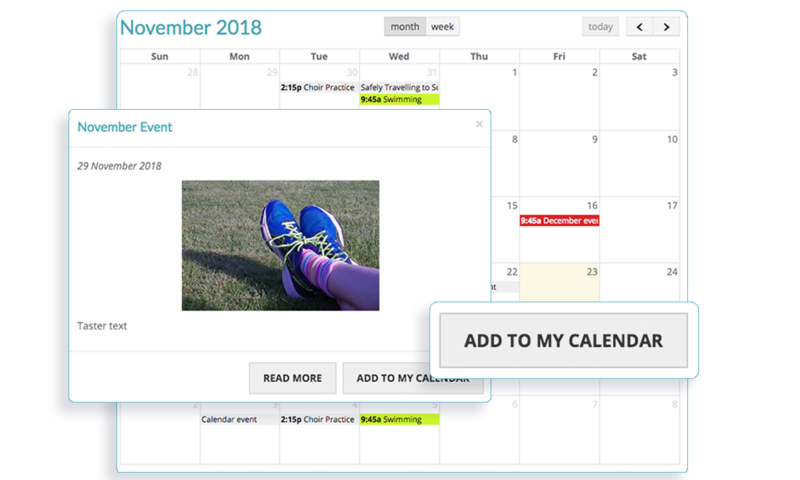 A huge engagement feature that allows parents to add your calendar events to their own calendars, on any device. They can subscribe to full calendars or a single event. 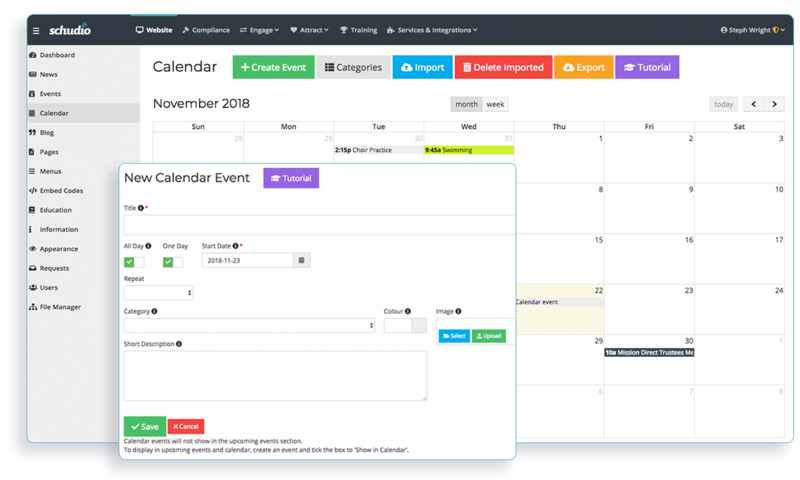 Your admin can import a calendar feed directly into your website so you don't need to duplicate the work, making it much easier to keep your calendar up to date. This powerful little tool gives you the option, (you can turn it off if you don’t want it! 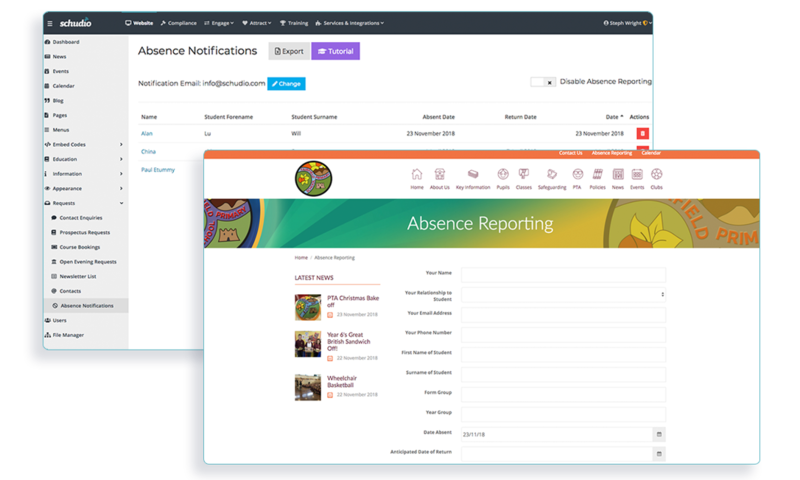 ), to allow parents to send absence notifications directly through the website, saving time for your team and storing a record of all absences. Meet Your Audience Where They’re At! The power of social media is being embraced by more and more schools and colleges. Through robust, considered integrations and expert support and advice, we can help you get started using social media channels effectively. That’s done through embedded feeds, widgets and training. 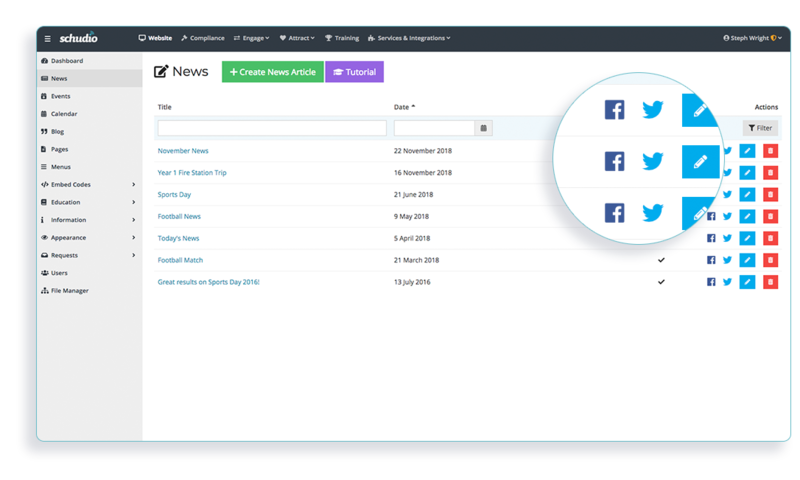 Safe lots of time by posting your News directly from within your school website software to Twitter and Facebook. It's just a click and a share. A school app is a brilliant tool if it’s well built and effectively used. It’s another string to your bow in the race to successful parental engagement. 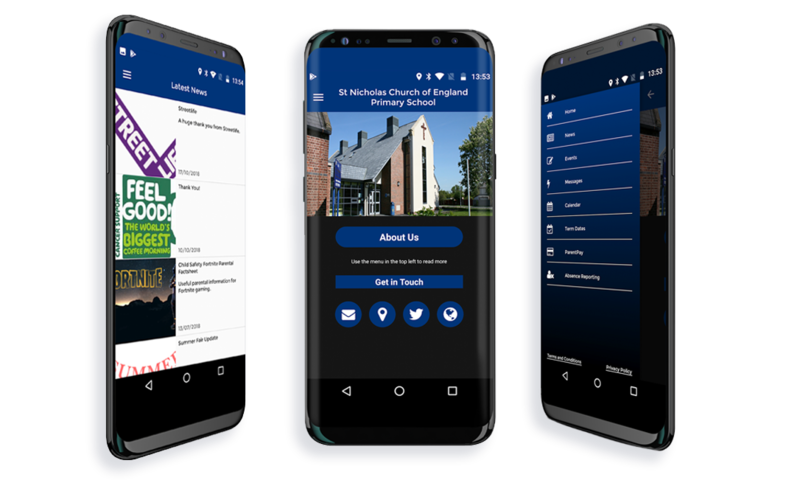 Our software was the first to integrate into a school app and it is completely free to everyone, whether you choose us for your school website or not. No catches. 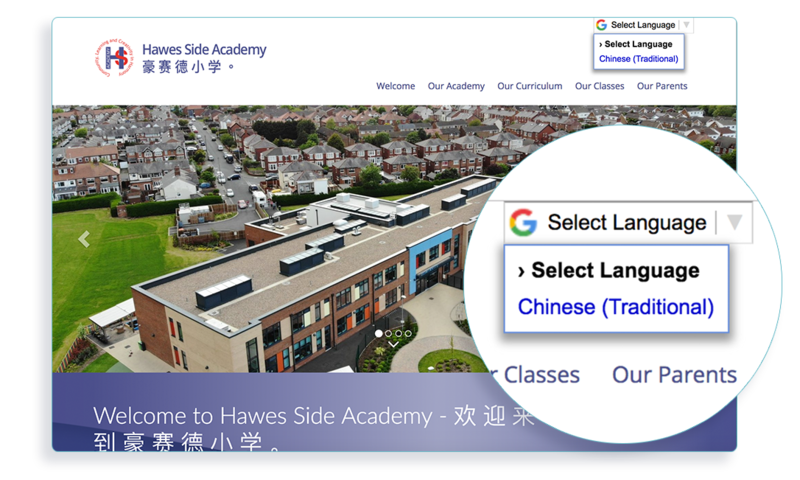 Through a bespoke integration of Google Translate we’re able to offer your school a customised range of languages to suit the needs of your specific community. It’s not just a list of every single language in the world, thrown onto your website. It’s an integration that will includes every person in your wider school community. 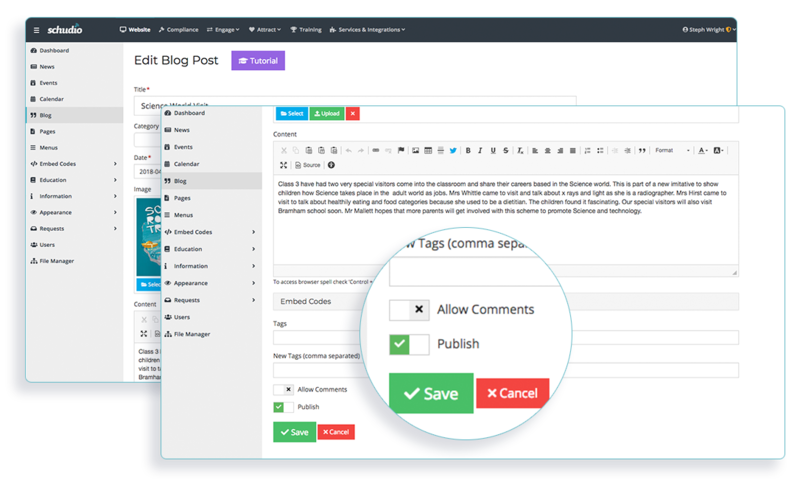 You’ll have complete control over whether or not you use comments on your blog. Then of course you get to approve any comments before they go live. Encouraging your parents to interact with you through your school website blog is a brilliant way to foster greater engagement. Every website we set up is integrated with Google Analytics to give you incredible insight into the use of your new website. From simple data such as how many monthly visitors and page views, to detailed analysis on the type of users, where they are, how they found your site and what device they’re using. We can provide advanced training and reporting and strategic advice on how you can improve your content. Schudio offers a full suite of software for engagement, communications and compliance, with a completely free range of resources and tools at it's core. Each is powerful on it's own - but they're even better when your school uses them together. Focus on reaching 100% compliance and then tell the stories of life in school. We’ll make it easy. Every website we build comes with every feature you need to keep your website compliance, fresh and engaging. 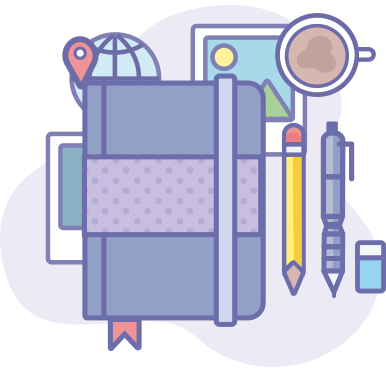 We’ll transfer your content, provide helpful, expert-led training and provide an unbeatable package of support. All of this comes as standard so you know exactly what you’re getting. 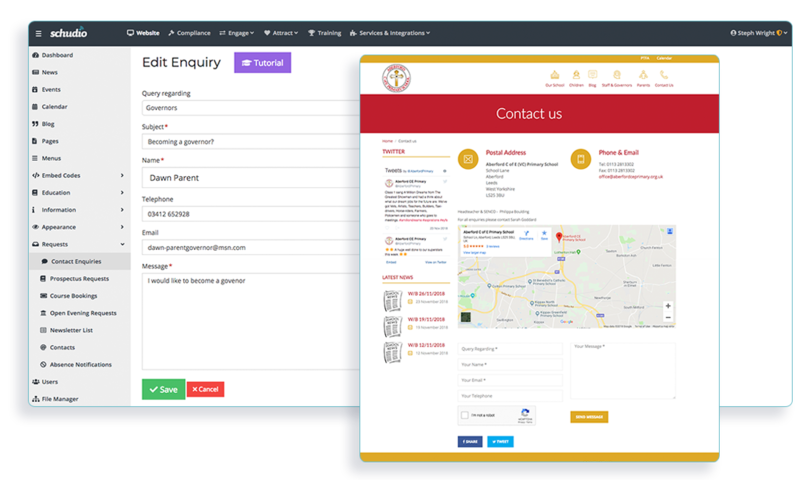 Fully integrated with our School Website Compliance Software so you are able to easily maintain 100% compliance all year round. An unrivalled array of easy to use, time-saving tools that allow you to take more control of your website than you thought possible. 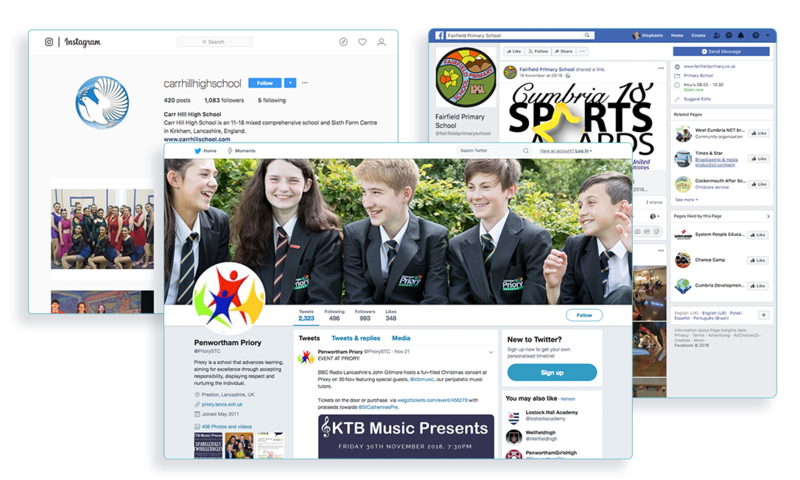 Products to help you engage your school community and reach them where they are and turn them into active promoters. All seamlessly tied together. Admissions, HR and recruitment tools to help you attract the best students and teachers, automate key processes and maintain robust data.